Students in FASH455 were excited to have Laurie Sutandar, Vice President of U.S. Sourcing, JCPenney Corporation join the class as a guest speaker. Based on her 30+ years of experiences as sourcing executive, Laurie shared her insightful observations and first-hand stories of U.S. fashion apparel companies’ sourcing models, the selection of sourcing destination, emerging sourcing trends, and the impact of trade policy on the future landscape of apparel sourcing. Laurie also shared her valuable advice about sourcing-related career preparations. Students in FASH455 had a unique opportunity hearing from Bill Jackson, Assistant U.S. Trade Representative for Textiles (2016—present) about the textile and apparel provisions in NAFTA 2.0 (or newly called the US-Mexico-Canada Free Trade Agreement, USMCA). As the top U.S. trade official for textile and apparel issues, Bill is responsible for conducting and overseeing negotiations affecting textile and apparel products, advising the U.S. Trade Representative on textile and apparel trade policy matters, and working to expand the industry’s access to foreign markets. He was the lead U.S. negotiator on market access for textiles and apparel during the last several months of the Trans-Pacific Partnership free trade agreement negotiations in 2015. Mr. Jackson served as Deputy Assistant U.S. Trade Representative for the Generalized System of Preferences (GSP) trade preference program from 2010 to 2016 and Director for African Affairs at the U.S. Trade Representative Office (USTR) from 2002 to 2010, during which he worked on a wide variety of U.S.-African trade and investment issues, including administration of the African Growth and Opportunity Act (AGOA) trade preference program. Students in FASH455 had an exciting live discussion on the NAFTA renegotiation and the U.S. textile and apparel industry with Joshua Teitelbaum, Deputy Assistant Secretary of Commerce for Textiles (2014-2016). While serving as one of the top U.S. trade policymakers for the textile and apparel industry in the Obama Administration, Mr. Teitelbaum made substantial contributions to the development of the Trans-Pacific Partnership (TPP), and the Trans-Atlantic Trade and Investment Partnership (T-TIP), among other multilateral, regional and bilateral trade initiatives. Mr. Teitelbaum also served as the chairman of the Committee for the Implementation of Textile Agreements (CITA), which supervises the negotiation and implementation of U.S. textile trade agreements. Mr. Teitelbaum received his J.D. from The George Washington University Law School in 2008 and his B.S. from Cornell University in 2005. During the event, Mr. Teitelbaum shared his insightful views about the Trump Administration’s motivation of launching the NAFTA renegotiation, the debate on the yarn-forward rules of origin and exceptions (e.g., tariff preference level) and the industry implications of rejoining the Trans-Pacific Partnership (TPP). Students were excited to have Nate Herman, Senior Vice President of the American Apparel and Footwear Association (AAFA) as a guest speaker for FASH455. Nate Herman oversees AAFA’s government relations department, managing the association’s trade policy, and regulatory affairs activities. Nate leads AAFA’s corporate social responsibility (CSR) program, formulating and implementing CSR policy and representing AAFA and the industry on CSR issues before governments, NGOs, and other key stakeholders. Nate also leads the association’s work on sustainability, transportation, logistics, and customs issues. In addition, Nate develops all apparel and footwear industry data and statistics as AAFA’s resident economist. Prior to joining AAFA, Nate worked for six years at the U.S. Department of Commerce’s International Trade Administration assisting U.S. firms in entering the global market. Nate spent the last two years as the Department’s industry analyst for the footwear and travel goods industries. During the event, Nate shared with his insightful views of the global nature of today’s apparel industry, U.S. fashion brands and apparel retailers’ sourcing strategy and critical trade policy issues that matter significantly to the apparel sector, including tariff barriers, NAFTA renegotiation, renewal of the Generalized System of Preferences (GSP) and implications of the 232 trade investigation. The FASH455 class had an exciting dialogue with Erin Ennis, Senior Vice President of the US-China Business Council (USCBC) on international trade and the US-China trade relations. Erin Ennis has been Senior Vice President of USCBC since February 2015, after serving as Vice President since 2005. In that position, she directs USCBC’s government affairs and advocacy work for member companies and oversees USCBC’s Business Advisory Services. Before joining USCBC, Ms. Ennis worked at Kissinger McLarty Associates, the international consulting firm headed by former Secretary of State Henry Kissinger and former White House Chief of Staff Thomas “Mack” McLarty. At Kissinger McLarty, Ms. Ennis was responsible for implementing strategies for international business clients on proprietary trade matters, primarily in Vietnam and Japan. Before entering the private sector, Ms. Ennis held several positions in the US Government. From 1992 to 1996, Ms. Ennis was a legislative aide to former U.S. Senator John Breaux, working on international trade and commerce. At the Office of the US Trade Representative from 1996 to 2000, Ms. Ennis first worked in Congressional Affairs on Asia issues, including annual approvals of China’s most favored nation status and the ill-fated 1997 push to renew presidential “fast track” negotiating authority. Beginning in 1998, she was assistant to Deputy US Trade Representative Richard Fisher, who led US trade negotiations and enforcement with Asia, the Americas, and on intellectual property rights. During the event, Erin shared her insightful views on several critical issues facing the US-China trade, from the debate on trade imbalances, implications of China’s WTO membership, managing the trade disputes, challenges facing US businesses operating in China to the Trump Administration’s China policy. During the Q&A session, students also asked questions about the potential impact of imposing a punitive tariff on U.S. imports from China. The FASH455 class had an exciting dialogue with Ambassador Friedrich Loehr, former Consul General of Germany in Boston (2008-2012) on foreign policy in the Trump era. Ambassador Loehr is a career officer in the German diplomatic service. He was Ambassador to North Korea from 2005 to 2007 and Deputy Chief of Mission in Beijing, China form 2002 to 2005. He has held a number of distinguished German Foreign Office posts, including Minister-Counselor of the Department of Arms Control and Disarmament; Adviser to the Policy Planning Group of the CDU/CSU party at the Bundestag; and Deputy Director of European Political Affairs in the Chancellor’s office. He has served overseas in German embassies in Algeria, Sudan, Czech Republic, Hungary, and Serbia. He also represented Germany in international organizations including the United Nations and the European Union. Ambassador Loehr is currently on the faculty at Northeastern’s College of Professional Studies is a former fellow of the Weatherhead Center for International Affairs at Harvard. During the event, Ambassador Loehr shared his insightful views on the anti-globalization movement, the impact of Brexit on the future of the European Union and US-EU partnership, implications of a rising China to the world, Trump administration’s foreign policy agendas and some other current world affairs. Students in FASH455 had an exciting live discussion on the renegotiation of the North American Free Trade Agreement (NAFTA) with David Spooner, former U.S. Chief Textile Negotiator and Assistant Secretary of Commerce. As Chief Textile Negotiator at the U.S. Trade Representative Office, David was a principal negotiator for free trade agreements with Central America, Singapore, Australia, Chile, Panama, Bahrain, Colombia, and Peru, principally negotiating the apparel and textile chapter, rules of origin and safeguard measures. During the event, David shared his insightful views about why the Trump Administration proposes to renegotiate the 23-year-old NAFTA, the outlook for the renegotiation, the economic and political factors behind the debate about the yarn-forward rules of origin as well as the business implications for the proposed elimination of the tariff preference level (TPL) from NAFTA. Students in FASH455 were honored to have Ron Katanick, Vice President of Strategic Sourcing, Kohl’s Department Stores join the class as a guest speaker. Based on his 20+ years of industry experiences, Ron shared his insightful observations and first-hand stories of U.S. fashion apparel companies’ sourcing model, the selection of sourcing destination, emerging sourcing trends, and future landscape of apparel sourcing. During the Q&A session, students asked questions about the outlook of apparel “Made in the USA,” sourcing related career opportunities, and other current events in the U.S. apparel industry. Students in FASH455 had an exciting discussion with Ryan Ong, Director for International Economic Affairs Policy at the National Association of Manufacturers (NAM). Ryan shared his views on the state of the U.S. manufacturing sector and international trade, the debate regarding the U.S. trade deficit, and how trade policy can promote robust manufacturing in the United States. During the Q&A session, students also raised questions about the impact of Brexit, U.S.-China trade relations and the future of textile and apparel manufacturing in the United States. Gail Strickler, Assistant U.S. Trade Representative for Textiles (2009-2015), who negotiated the textile chapter under the Trans-Pacific Partnership (TPP), visited FASH455 and had a special discussion session with students on topics ranging from the textile and apparel rules of origin in TPP, NAFTA renegotiation, AGOA renewal and state of the U.S. textile and apparel industry. Gail also delivered a public lecture on The Global Apparel Industry – Style and Substance as part of the Fashion and Diplomacy Lecture Series sponsored by the Institute for Global Studies and the Department of Fashion and Apparel Studies. Students in FASH455 had a unique opportunity discussing trade agreement and the U.S. textile and apparel industry with Bill Jackson, Assistant U.S. Trade Representative for Textiles (2016—present). 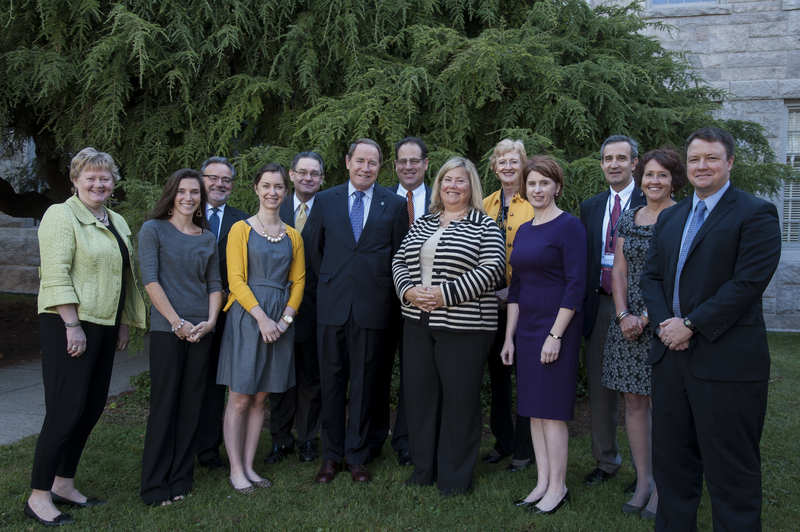 As the top U.S. trade official for textile and apparel issues, Bill is responsible for conducting and overseeing negotiations affecting textile and apparel products, advising the U.S. Trade Representative on textile and apparel trade policy matters, and working to expand the industry’s access to foreign markets. He was the lead U.S. negotiator on market access for textiles and apparel during the last several months of the Trans-Pacific Partnership free trade agreement negotiations in 2015. Mr. Jackson served as Deputy Assistant U.S. Trade Representative for the Generalized System of Preferences (GSP) trade preference program from 2010 to 2016 and Director for African Affairs at the U.S. Trade Representative Office (USTR) from 2002 to 2010, during which he worked on a wide variety of U.S.-African trade and investment issues, including administration of the African Growth and Opportunity Act (AGOA) trade preference program. Students in FASH455 were very honored to have the great opportunity discussing the Trans-Pacific Partnership (TPP) and its implications for the global textile and apparel industry with Gail Strickler, Assistant U.S. Trade Representative for Textiles (2009-2015). As the top U.S. trade policymaker for textiles, Ms. Strickler supervised the negotiations of the textile and apparel chapter in TPP as well as other important trade agreements affecting textile and apparel products. She also advised US Trade Representative, including Ambassador Ron Kirk and Ambassador Michael Froman, on textile and apparel trade policy matters and worked to expand the industry’s access to foreign markets. Prior to joining the U.S. Trade Representative Office, Ms. Strickler worked for Saxon Textile Corp from 1980 to 2007 serving ultimately as its President and CEO until it was acquired by Patriarch Group in 2007 and became a division of Duro Textile LLC., where she served as Vice President of the Global Apparel Division. Ms. Strickler also served as the Assoc. Director of the Institute for Textile and Apparel Product Safety (I.T.A.P.S.) at Philadelphia University and president of the Textiles Distributors Association. She further served on the board of directors of the National Council of Textile Organizations (NCTO) from its inception in 2004-2006 as a member of its Trade Policy committee. She was a board member for the USDA Cotton Board from 2002 to 2009, serving as Chairman of the Textile Research Committee. She has served on the board of directors at the Fashion Institute of Technology’s Education Foundation since 2004 and its executive committee from 2006 to 2009. Students in FASH455 had a great dialogue with Maureen Gray, Vice President of International Trade, Ralph Lauren Corporation (2011-2016) on global sourcing strategies of US fashion apparel companies. As VP of International Trade, Maureen Gray champions Ralph Lauren’s Customs and trade issues. Maureen Gray is also a strong voice for the U.S. apparel industry during the negotiating of the Trans-Pacific Partnership agreement. As commented by Kim Glas, executive director of the BlueGreen Alliance and former deputy assistant secretary for textiles, consumer goods and materials at the Commerce Department, “Maureen Gray brought a lot of industry know-how to the [TPP] negotiations, from understanding supply chains and understanding the incentives to help move or shift supply chains. Her knowledge of Customs enforcement was critical through the negotiations.” From 2011 to June 2016, Maureen also served as the chairman of the U.S. Fashion Industry Association (USFIA). Students in FASH455 had a unique opportunity Skyping with David Spooner, former U.S. Chief Textile Negotiator and Assistant Secretary of Commerce. As Chief Textile Negotiator at the U.S. Trade Representative Office, David was a principal negotiator for free trade agreements with Central America, Singapore, Australia, Chile, Panama, Bahrain, Colombia and Peru, principally negotiating the apparel and textile chapter, rules of origin and safeguard measures. In the Commerce Department, Mr. Spooner led U.S. Government enforcement of trade remedy laws, principally the anti-dumping and anti-subsidy laws. He administered the Foreign Trade Zone system; oversaw apparel trade policy and the implementation of laws governing trade in apparel; managed trade remedy negotiations at the World Trade Organization (WTO), as well as dispute resolution proceedings at the WTO; chaired U.S.-China talks on macroeconomic reforms and the steel industry; and supervised the US Department of Commerce’s import safety initiatives. 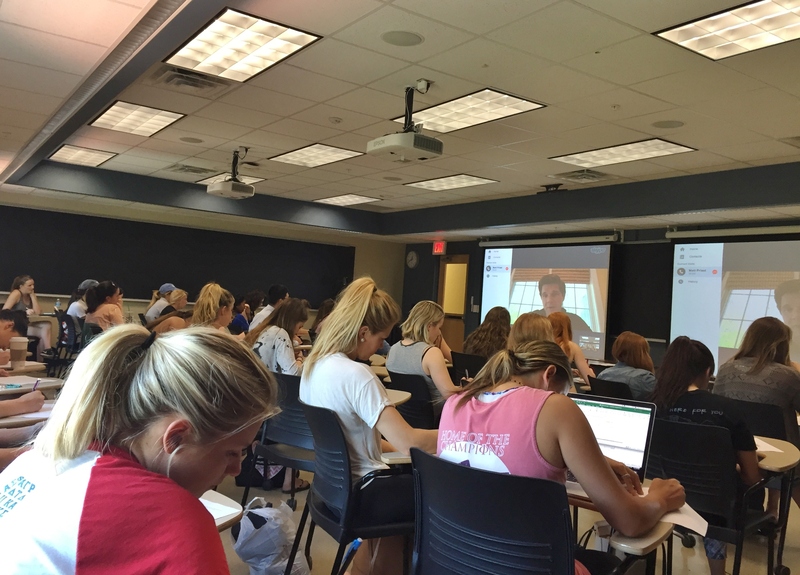 Students in FASH455 had an exciting Skype discussion on the U.S. footwear industry and related sourcing issues with Matt Priest, President of the Footwear Distributors and Retailers of America (FDRA). Before joining FDRA in February 2009, Mr. Priest served as Senior Advisor to Commerce Secretary Carlos Gutierrez and Deputy Assistant Secretary for Textiles and Apparel at the U.S. Department of Commerce. As deputy assistant secretary, he oversaw programs and strategies to improve the domestic and international competitiveness of the U.S. footwear, fiber, textiles, and apparel industries. Mr. Priest was also Chairman of the Committee for the Implementation of Textile Agreements (CITA), which determines when market-disrupting factors exist in the domestic fiber, textiles and apparel marketplace. Mr. Priest is also featured in the well-known book the Travels of a T-shirt in the global economy. The 2014 URI Cotton Summit intends to raise public awareness of the importance of the cotton and related textile and apparel industry in the 21st century global economy. The summit also provides a valuable forum for faculty, students, industry leaders and policymakers to exchange ideas and enhance dialogues on critical global issues associated with the cotton and related textile and apparel industry. The summit is sponsored by the Import Support Program of the Cotton Board and with supervision from Cotton Incorporated. Keynote speakers and special guests for the 2014 URI Cotton Summit (from Left to right in the picture):Julia Hughes, President, U.S. 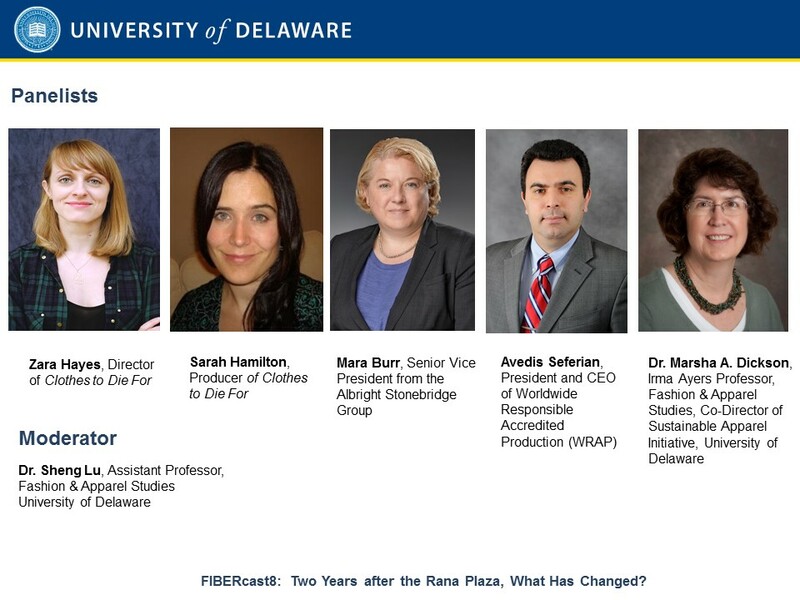 Fashion Industry Association; Dr. Stacey Frederick, Research Scientist, Center on Globalization, Governance & Competitiveness at Duke University; Robert Antoshak, Managing Director, Olah Inc.; Jenna Oschwald, Manager, Global Supply Chain Marketing, Cotton Incorporated; David Trumbull, Principal, Agathon Associates; Dr. David M. Dooley, President, University of Rhode Island; Nate Herman, Vice President, American Apparel and Footwear Association; Elizabeth King, Vice President, Cotton Board; Dr. Kitty Dickerson, Consultant & Professor Emerita, University of Missouri; Erin Ennis, Senior Vice President, US-China Business Council; Augustine Tantillo, President & CEO, National Council of Textile Organizations; Maria D’Andrea, Supervisor of Office of Textiles and Apparel,U.S. Department of Commerce; Jon Devine, Senior Economist, Cotton Incorporated. Photo credit: Michael Salerno. Case study as a teaching method is regularly used in FASH455. Through case study, students have the chance to apply what they’ve learnt in the lectures into thinking and solving real-world problems. Case study also improves students’ skills in critical thinking, oral presentation, writing as well as working in teams. In general, each case study includes three inter-connected learning activities: written case analysis (individual work by students), small group discussion (5-6 students/group) and plenary case discussion (whole class) led by the instructor. Special thanks to the Center for Teaching and Assessment of Learning at the University of Delaware for funding the trip to attend the Harvard Business School Case Teaching Method Training Seminar in March 2016. President Obama launched the National Export Initiative (NEI) in late 2009 which intends to double the U.S. export over the following five years. The U.S. textile and apparel industries both welcome the initiative and play important roles contributing to the reaching of the goal. 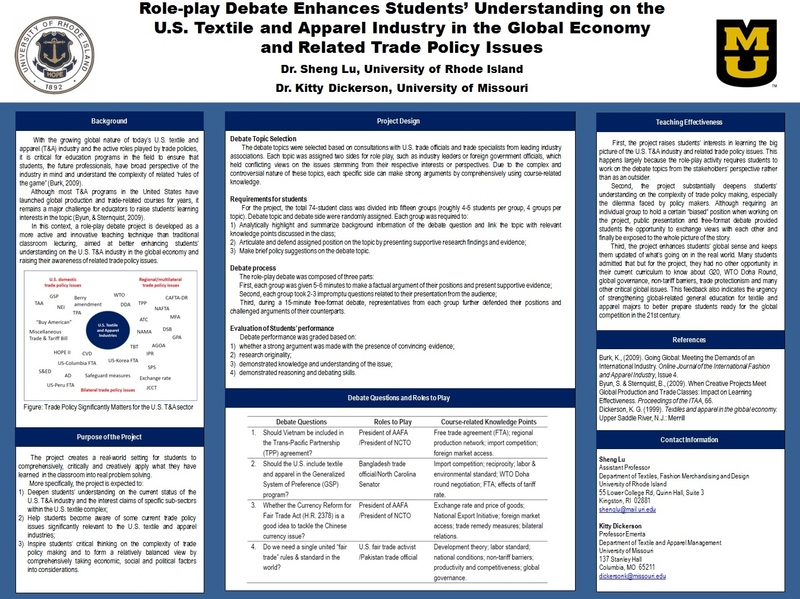 In this context, students play the role of export promotion specialists for the Office of Textiles and Apparel (OTEXA) under the U.S. Department of Commerce. In the form of teamwork, each group focuses on a specific foreign country and evaluates its potentials as an export market for U.S.-made textile & apparel. Market assessment is based on studying secondary sources (such as UN COMTRADE database, OTEXA tariff database, industry publications, consulting & research papers, etc) and in-depth interviews with 1-2 international students/scholars originating from the examined country. Four aspects are specifically evaluated: 1) economy and market; 2) trade patterns; 3) business culture and 4) market-access related policy. At the end of the semester, students present their findings & export recommendations both orally and in the written report. Help student recognize the importance of textiles & apparel (T&A) industry in today’s global economy and its unique economic, social and political contributions to major economies around the world. Enhance students’ knowledge about major emerging markets in the world and inspire their critical thinking on the potential business opportunities for U.S. T&A companies in these markets as well as unique market access challenges. Raise students’ awareness of ethnic and cultural diversity in the world and prepare them for global citizenship in the 21st century. Improve students’ market research, information collection and data analysis skills. Enhance students’ teamwork, leadership and presenting skills.